A little while ago I proposed a set of spell guidelines for Imagonem magic involving sound, and participated in a robust debate on the Ars Magica forums. This post is a follow-up as sample spells using those guidelines. This is perhaps to demonstrate the leverage from Imagonem as more than just visual images, and also to demonstrate the relative power levels to other spell effects. The caster creates a short high pitched burst of sound next to a glass item, which is shattered by the sound. The caster must succeed a Finesse check vs base 6 to correctly target the sound. The sound created is very loud. Impossible, yes sir and madam, I say impossible! The April-Post-a-Day challenge is crushed for me, and given how little time I’m getting to post I was in hindsight silly to expect to be able to post a few items each day to catch-up. A delusional dream that I enjoyed for a time. That said, I’m going to keep slowly writing blogs about the alphabet until I complete the A-Z; but not worry about completion by end of April. These posts will instead be intermixed with other posts, and the savvy and smart folks out there might take bets on which month or year I get to Z. Maybe by next year I’ll have a full set. Healers are the unsung hero of RPGs. I dislike playing them, but really appreciate those who like them. In some PC games the healer is a small red potion. That’s ok, they are very portable, but they are often expensive. In dnd the healer used to be the last created, and somewhat thankless. In 4e dnd the healer was diversified, but still a backbone of every team. In wow the healers are always handy, and a good one is brilliant. In ars magica any magus can choose to be a healer, but the magic is too expensive to use flippantly. Bandages are often more cost effective for soldiers. Make a healer angry today, and you’re in strife tomorrow. Make one happy and you’re on easy street. No, no, not grinder; Grind. As in The Grind. That feeling in games when you’re tasked with completing an objective, but it will take a long time to get done mainly through repetitive tasks. As a wow player I’ve been conditioned to grinds as a normal part of “gameplay”. I accepted early game creators could not create content as fast as I could consume it, so in-built repeats are needed. This is especially true of MMO games, where the content can be consumed at a staggering pace. Such is life. A grind is not so bad either, if combined with a story element. The reason that the same daily quests are present could be that the problem cannot be solved simply once. Working at a prolonged quest can feel appropriate. and yesss, oh yess, Coffee. Then there is the grind which is somewhat pointless – to only gain a secondary objective. I get that too, but wish the games would cover the grinds in a little more smoke and mirrors to keep them bound within the story. Fire magic is present in almost all rpgs, and as I’m an Ars Magica magic system fan, here are some run-ups of the spell guidelines for Ignem (fire) spells (a part I really like is the naming of the spells). Some effects might not be perfectly in-line with the core spell guidelines, and often Ars Magica spells cause debate due to many interpretations or variations. YSMV. This effect ignites a targeted item item quickly providing a fire which will likely destroying it and leaving only ash. The spell was invented for use on writs and other paper documents which could be either incriminating or hold Magi to agreements which they would prefer to avoid. A second version of the spell was invested which could be used at great range using an arcane connection, for those documents that the caster wishes to remove after signing them, and handing them to another. This effect ignites an item connected via an arcane connection, thereby providing a fire which will likely destroying it. The item may be in almost any anything slightly flammable such leather, damp wool. The spell was invented for use on writs and books, but can also be used to ignite almost any material. Up to ten metal items carried by or on the target are heated to melting point. Thus a soldiers sword, helm, and segments of armor will all instantly be burning hot, and melt. This has a side effect of inflicting +5 damage per round while metal items targeted are carried or worn. This spell changes a fire up to the size of a small campfire (+5 damage) into an arrow or bolt suitable for use by an archer. The size and form of the projectile is chosen by the caster. The arrow can be used and fired normally until the duration of the spell expires, when it will revert back into a fire. related to successful story objectives, rather than kills, dice-rolls, or dumb luck. rewarded extra for clever ideas. rewarded extra for great roleplaying (a.k.a. acting). rewarded for allowing others to enjoy the game too. I’m not a fan of XP penalties, it seems counter intuitive to offer a disincentive to a hobby activity. The rewarding for “good” roleplaying is a tough one. Giving one player a bonus for being a solid player is good, this might affect other players, where they see they cannot compete and therefore not try. That is a tough situation, and done best by (a) making the extra reward difference between players very small, and (b) perhaps not doing it initially to allow the players to warm-up. Another thought I have, although I’ve not tried it yet is keeping the characters on exactly the same XP always. This removes the incentive for rewards, but also removes the penalties if a player cannot play for a reason. The team advance together. I really wish to try this in a game that is sympathetic to group advancement. D is for Dungeon, and Delve, Decent, and Danger. I love a good dungeon. The old dnd experience tucked away in the back of my skull remembers with glee the slow reveal of a huge dungeon map (Undermountain, Menzoberenzan, Queen of the Demon Web, etc). Each 10 ft square added a new set of challenges, columns, traps, and randomly generated monsters. Hand drawn maps that wrapped onto 3 different grids, using a variable scale, with cheetos fingerprints. I recently grabbed a map from Dave’s Mapper as an attempt to use a random dungeon and was pleased by the experience. 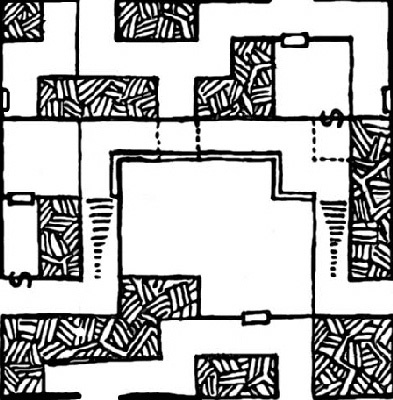 It does not remove the need to populate each room, or decide where the traps go, but it does allow the generation of oddly connected dungeon crawls. I also used a map created by Jon from Fantastic Maps – a cave in which a set of Diabolists lived. It really helped me to have a map to work against for the encounters. A contained space, which can be “cleared” and has a finite time needed, and nice constrained scope. A dungeon area could certainly be limitless, but most are purpose specific. The characters get in, go crazy with powers, and get out to rest and sell the loot. It is the same buzz as a good raid in an mmo, and I think it is still great fun to this day. Now to get back to smashing crates, drinking the tepid water pools, and robbing the goblins of all their Wands of Magic Missles.